Preparing for IPU LLB Exam? Read this First! Home » IPU LLB Exam » Law » Preparing for IPU LLB Exam? Read this First! The IPU LLB is a university level exam which is conducted by the Guru Gobind Singh Indraprastha University (GGSIPU). The basic eligibility for the test is that the aspirant must have passed class 12th from a recognised board and that they should have secured a minimum of 50% aggregate score in all subjects. The candidate should have English as a subject which has been cleared in the Class 12 examination. As per the directions of the Hon'ble High Court, he IPU CET does not have any age restriction and thus aspirants of any age can apply and take the test. The IPU LLB is held across in 15 cities in India. The paper pattern comprises of 150 questions for a total of 600 marks and the paper has to be completed in duration of two and a half hours. There is negative marking in the test. For every correct answer you get 4 marks and for every incorrect answer one mark is deducted. The exam pattern consists of a total of 4 sections. The General Knowledge section carries a 25% weightage, the English Language and Comprehension carries 25%, Legal Aptitude (General Legal Awareness and Understanding and Application of Legal Principles) carries 25% and the Reasoning section carries 25% weightage. The Question Paper is set in English language only. The list of the participating institutes in the IP university LLB can be found on the official website of GGSIPU law which offer admissions to qualifying candidates based on their scores in the exam. 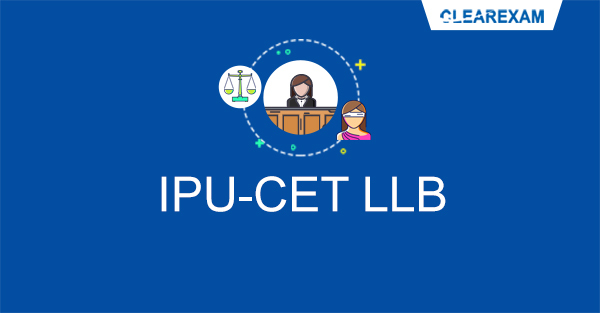 There are a total of 8 Universities that participate in the IPU CET law. All the participating universities offer 2 undergraduate courses; BA LLB IP University and BBA LLB IP University. In total they all offer 1700 and 660 seats for the two undergraduate programs respectively. Following is a guide to all the important study tips needed for cracking CLAT. If the candidate can try and adhere to most of the tips listed herein, he or she will be surely able to crack the exam. Decide: Decide that law is what you really want to do and score one of the top universities in the country. An ideal time to decide this would be the end of Class XI since it gives you a full year to focus on your preparation while managing your studies for Class XII as well. Strategize: A good strategy involves a simple time table made by you for yourself and not the kind which we follow for a day and then forget about. This is an important part of your preparation since it will help you manage your Class XII studies, tuitions and other commitments along with your IPU LLB prep. Stick to Schedule: Once the study plan is formed, the candidate should stick to it. They should read the material in a timely manner and be aware of all the concepts ahead of time so that they possess a big picture of the topics and concepts involved. Read Regularly: For efficient preparation, inculcating a reading habit is extremely important. You should read newspapers and periodicals on a regular basis. It will help in staying apprised with the latest news and current affairs from India and rest of the world and will increase your reading speed which will prove to be beneficial as you will be able to cover the questions faster. Personal Diary: Another tip I would like to share is to maintain a personal diary with you. The purpose of this diary is mainly to keep track of your progress. This diary will be a self reflection of how you are performing and progressing. So basically at the end of every day I took out 5 minutes to jot down my prep highlights and it helped me tremendously. If you have joined IPU LLB exam coaching then should note the progress made there and what all topics have been covered in the different classes. Revise and Review: It is important to revise regularly. The concepts will start to imprint in your mind and the whole exercise will become expedient soon enough. Students taking coaching should positively attend the revision classes which are held in their respective centres. Mock Tests: The candidates should reserve the last month for taking mock tests. These can be online mock tests or previous years question papers. If the candidate has joined IPU LLB exam coaching then they can easily avail the mock test series given by the coaching centres. There are a couple of things that the candidate should keep in mind for the exam day. They should make sure that they have read up on all the instructions as would have been mentioned in their Admit Card which has to be downloaded from their website. All the relevant details of the test (time, venue) are mentioned on the admit card. They should reach the test centre on time so that they do not take unnecessary stress. Along with the admit card, they should carry all their requisite documents along with the required photo ID proof as impersonation is considered to be a serious offence and may attract severe punishment. Candidates should not talk to anyone once inside the examination hall as any candidate found following any unfair means will be debarred from appearing in the IPU LLB exam. At the end of the day, it is important to have a positive outlook towards your preparation and the exam. Being negative and doubtful about your preparation will only lead to anxiety which hampers performance. I would suggest that you stay constantly motivated and positive throughout the three stages. All the candidates should take efforts to root out the negativity from around them so that your goal to successfully crack the IPU LLB exam is unfettered. Know your syllabus in and out, work diligently on a regular basis and be self-aware and true to yourself about your progress and you will crack this test with much ease. Have fun, enjoy your last year of school without compromising on your daily prep goals. And finally, do not worry about what score or rank you will get, as long as you have put in the work and effort sincerely, the results will automatically show. Law, Management & Hotel Management Exam Preparation | Clear Law Entrance: Preparing for IPU LLB Exam? Read this First!